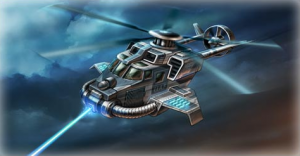 This article will examine a few of the unusual aircraft from Command & Conquer, including the Kirov, Siege Chopper, and Cryocopter’s S.H.R.I.N.K. Beam. 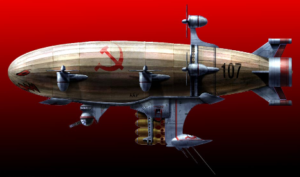 Kirov Airships are icons of Soviet power in Red Alert 2 and 3. Perhaps the top two things the Kirov is known for is dropping a lot of bombs and being difficult to shoot down. Do either of these even make sense for the Kirov? Yes, actually. The Kirov is a rigid airship, which must not be confused with a blimp. While a blimp is basically a large balloon filled with a light gas under pressure to fill it out, a rigid airship has a metal frame with several gas bags inside that are not under pressure. The primary purpose of the smooth outer covering of the rigid airship is to protect the inner gas bags from wind damage and make the airship more aerodynamic. If a blimp were punctured, the balloon would lose pressure and it would fall as the gas escapes into the atmosphere. However, since the gas bags of a rigid airship are not under pressure, the gas does not feel any great desire to escape if they are punctured so long as the air pressure outside of the airship remains approximately equal. Eventually, the gas will mix with the atmosphere, and the airship will not be able to stay up permanently, but the problem is far less significant than for a punctured balloon, especially since the rigid airship has many other gas bags that would be unaffected by a single point of failure. This means that shooting a rigid airship full of holes will not necessarily bring it down. Missiles would also have much more difficulty tracking an airship compared to conventional aircraft. 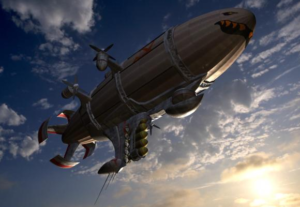 As for the payload, large airships can carry an amazingly high weight with ease, able to outmatch many cargo planes. The Kirovs in the eighth Allied mission in Red Alert 3 carried bombs with 50 Mt yields. The Tsar Bomba was the only 50 Mt yield bomb ever made and weighed 27,000 kg (60,000 lbs) with a length of 8 m (26 ft) and width of 2.1 m (12 ft). It was too big to fit in the Tu-95V that carried it without removing the aircraft’s bomb bay doors and fuel tanks from the fuselage. A Kirov would not only be likely capable of carrying such a bomb, but depending on its design, possibly even multiple of them. Unfortunately, it is highly improbable the Kirov would be able to survive dropping a 50 Mt nuclear bomb, as the airship would be far too slow to escape the blast area before detonation. It almost seems like the Kirov is such a capable aircraft, real militaries should start deploying them, but their greatest weakness both in-game and in the real world is their snail-paced speed. While it is certainly true that modern antiaircraft weapons would not be particularly useful against rigid airships, that it because they don’t need to be. If these vessels were introduced, weapons that were designed to take them down would probably be fielded faster than the airship itself. At best, rigid airships may make a comeback in the role of slower, but cheaper civilian cargo transport. 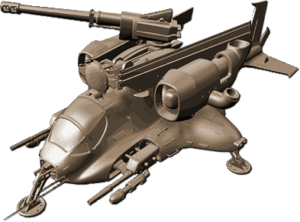 The Siege Chopper was added in Yuri’s Revenge as a flying mobile artillery unit, it is more versatile than the extremely slow V3 Launcher and unlike the rockets, its cannon shells couldn’t be shot down with mediocre antiaircraft coverage. What could be more cool than that? Well, a lot of things, apparently, since the Siege Chopper never made a return in any later games in the series. This artillery helicopter hybrid is obviously unrealistic, but is also slightly less unrealistic than one might expect. In the 1970s, the United States Army considered artillery helicopters. The original idea was to have a howitzer mounted to the helicopter that could be ready to fire as soon as the helicopter landed, however, further planning led to the concept of the helicopter mounting two cannons on either side that could be fired while still in flight, with at least one being detachable so it could be dropped off and used by infantry like a regular artillery emplacement. The cannons were to be of a light-weight design with soft recoil. Ultimately the idea was scrapped and attack helicopters as we know today use much more effective missiles. The folding rotor blades seen on the Siege Chopper are also based on real helicopters, although the purpose of this feature is for compact storage. It actually doesn’t make a lot of sense to fold back the blades in order to deploy a cannon from the top of the helicopter. 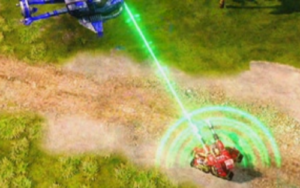 In Red Alert 3, the Cryocopter’s secondary weapon is a beam that can temporarily shrink a target into a miniature version. It is probably apparent to most that such technology is pretty far-fetched, but it is time to put its tiny flaws under the microscope and enlarge them to see just how far the fetching goes. First, the acronym should be studied to see if it gives us any clues as to how the beam is meant to function, S.H.R.I.N.K. stands for “Strong Homogenous Residual-Interactive Neutron Kinetic.” Well, that is quite the load of bovine excrement, not even quality technobabble. If anything meaningful can be extracted from that gibberish, it almost seems like neutrons are being partially phased into another plane of existence. At least that’s what we’ll run with, because it leads to the most interesting conclusion. The mass of a neutron is slightly greater than that of a proton, and the mass of electrons is negligible in relation to the overall weight of an atom. So if the mass of all neutrons could be negated from an object, it would weigh significantly less. Iron-56, which would make up most of a tank’s mass, would weigh 53.6% less without the mass of its neutrons. Usually, when fiction attempts to explain shrinking in a logical way, the common route is to reduce the empty space between subatomic particles, which makes up around 99.9% of an atom’s volume. This comes with the downside that weight is not only preserved (since empty space is weightless), but concentrated into a smaller volume. Nevertheless, even a 53.6% reduction in weight is insufficient, and the vehicles hit by the S.H.R.I.N.K. beam would not only fail to get the speed boost as depicted in game, but would likely sink into the ground under their own weight. Shrunken vehicles are also supposed to be easily crushed by normal-sized units, but their increased density would also make them stronger and more resistant to being crushed. Though if a larger vehicle drove over them, adding its weight to the already heavy shrunken unit, it would press it even deeper into the ground, where it may then be destroyed once its neutrons and atomic empty space return.